Ichthim: (ICK theem) A purple orchid-type flower favored by orcs. It can be used as a lover's flower (as we might use a rose) and is also often used on the graves of fallen war heroes. Ilian: Kyla's partner in an ill-fated double date with Aspen and Ilian's friend, Opin. Ilian is an elf who Kyla spots on the Proving Grounds and challenges to a fight with staves in exchange for a date to the Fall Ball. Inda: A gnome who works for King Oberon. He served for many years as a blacksmith until hid forge tipped and spilled molten steel onto his leg. Now crippled, he works as a goldsmith. His daughter Exa took his place in the smithy. Inga: A female giant. Blond-haired and ruddy-skinned, she spends most of her time outdoors. She owns her own fleet of mammoths and operates a shipping caravan. Kyla and Lug hire Inga to take them to the borders of Alfheim on their search for the Digans. Ipotane: (ip POT uh nee: I have never seen a pronunciation guide for this word, so this is what I am going with) An ipotane is a half-man, half horse, similar to a centaur. Depictions seem to allow for either four legs, or two. 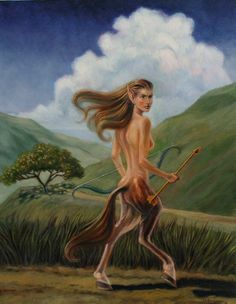 In Elf Mastery it is two-legged, and much like a satyr but with the legs, tail, and ears of a horse rather than a goat. Eunoe and Aspen encounter an ipotane guarding the stables when they are trying to go to the sun with Phaethusa. Janet: One of the humans of Whitehall. She is a nurse and neighbor to the Withers. Janim: (jan EEM) A Steed of Light beloved of Phaethusa. Though Phaethusa doesn't own Janim, she has ridden in his chariot to and from the sun since she began teaching at Equinox. Jax (Minister): The Minister of Public Works. Public Works is a widely inclusive field that includes infrastructure (such as roads, parks, etc). In Elf Mastery it includes the rotations of the earth, which allows for the day and night cycle. Minister Jax is thus ultimately the boss of Heff and Lug, though there are many layers of management in between. Jax lives and works in High Haven and answers to Queen Titania.